Yesterday I gave a super duper high level 12 minutes presentation about some issues of bias in AI. I should emphasize (if it's not clear) that this is something I am not an expert in; most of what I know is by reading great papers by other people (there is a completely non-academic sample at the end of this post). This blog post is a variant of that presentation. Structure: most of the images below are prompts for talking points, which are generally written below the corresponding image. I think I managed to link all the images to the original source (let me know if I missed one!). 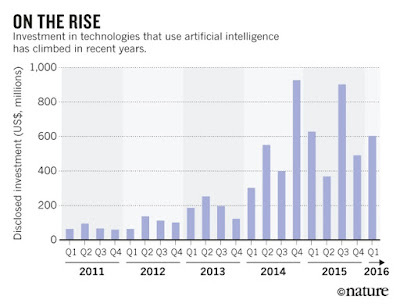 To me, AI is largely the study of automated decision making, and the investment therein has been growing at a dramatic rate. I'm currently teaching undergraduate artificial intelligence. The last time I taught this class was in 2012. The amount that's changed since there is incredible. Automated decision making is now a part of basically everyone's life, and will only be more so over time. The investment is in the billions of dollars per year. 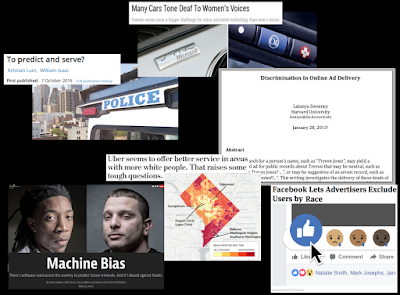 If you've been paying attention to headlines even just over the past year, the number of high stakes settings in which automated decisions are being made is growing, and growing into areas that dramatically affect real people's real life, their well being, their safety, and their rights. This is obviously just a sample of some of the higher profile work in this area, and while all of this is work in progress, even if there's no impact today (hard to believe for me) it's hard to imagine that this isn't going to be a major societal issue in the very near future. The standard way that machine learning works is to take some samples from a population you care about, run it through a machine learning algorithm, to produce a predictor. The magic of statistics is that if you then take new samples from that same population, then, with high probability, the predictor will do a good job. This is true for basically all models of machine learning. The problem that arises is when your population samples are from a subpopulation (or different population) for those on which you're going to apply your predictor. Both of my parents work in marketing research and have spent a lot of their respective careers doing focuses groups and surveys. A few years ago, my dad had a project working for a European company that made skin care products. They wanted to break into the US market, and hired him to conduct studies of what the US population is looking for in skin care. He told them that he would need to conduct four or five different studies to do this, which they gawked at. They wanted one study, perhaps in the midwest (Cleveland or Chicago). The problem is that skin care needs are very different in the southwest (moisturizer matters) and the northwest (not so much), versus the northeast and southeast. Doing one study in Chicago and hoping it would generalize to Arizona and Georgia is unrealistic. This problem is often known as sample selection bias in the statistics community. It also has other names, like covariate shift and domain adaptation depending on who you talk to. There's been a ton of work in machine learning land over the past twenty years, much of which builds on Heckman's original work. To highlight one specific paper: Corinna Cortes is the Head of Google Research New York and has had a number of excellent papers on this topic over the past ten years. One in particular is her 2013 paper in Theoretical Computer Science (with Mohri) which provides an amazingly in depth overview and new algorithms. Also a highly recommended read. When you move from one sample space (like the southwest) to another (like the northeast), you should first expect error rates to go up. Because I wanted to run some experiments for this talk, here are some simple adaptation numbers for predicting sentiment on Amazon reviews (data due to Mark Dredze and colleagues). 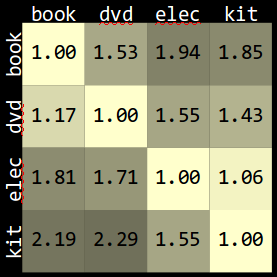 Here we have four domains (books, DVDs, electronics and kitchen appliances) which you should think as standins for the different regions of the US, or different demographic qualifiers. The figure shows error rates when you train on one domain (columns) and test on another (rows). The error rates are normalized so that we have ones on the diagonal (actual error rates are about 10%). The off-diagonal shows how much additional error you suffer due to sample selection bias. In particular, if you're making predictions about kitchen appliances and don't train on kitchen appliances, your error rate can be more than two times what it would have been. These data sets are balanced: 50% positive, 50% negative. If you train on electronics and make predictions on other domains, however, you get different false positive/false negative rates. This shows the number of test items predicted positively; you should expect it to be 50%, which basically is what happens in electronics and DVDs. However, if you predict on books, you underpredict positives; while if you predict on kitchen, you overpredict positives. So not only do the error rates go up, but the way they are exhibited chances, too. This is closely related to issues of disparate impact, which have been studied recently by many people, for instance by Feldman, Friedler, Moeller, Scheidegger and Venkatasubramanian. One thing I've been trying to get undergrads in my AI class to think about is what are we optimizing for, and whether the thing that's being optimized for is what is best for us. One of the first things you learn in a data structures class is how to do graph search, using simple techniques like breadth first search. In intro AI, you often learn more complex things like A* search. 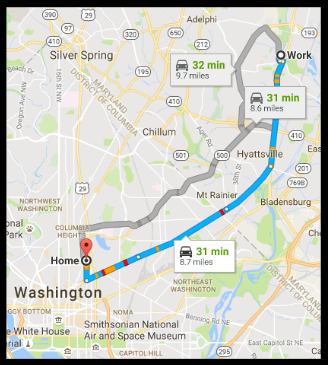 A standard motivating example is how to find routes on a map, like the planning shown above for me to drive from home to work (which I never do because I don't have a car and it's slower than metro anyway!). We spend a lot of time proving optimality of algorithms in terms of shortest path costs, for fixed costs that have been given to us by who-knows-where. I challenged my AI class to come up with features that one might use to construct these costs. 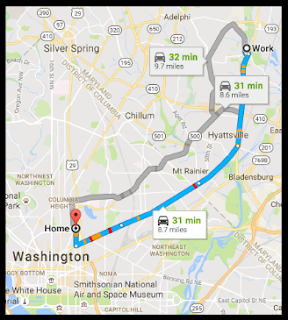 They started with relatively obvious things: length of that segment of road, wait time at lights, average speed along that road, whether the road is one-way, etc. After more pushing, they came up with other ideas, like how much gas mileage one gets on that road (either to save the environment or to save money), whether the area is “dangerous” (which itself is fraught with bias), what is the quality of the road (ill-repaired, new, etc.). You can tell that my students are all quite well behaved. I then asked them to be evil. Suppose you were an evil company, how might you come up with path costs. Then you get things like: maybe businesses have paid me to route more customers past their stores. Maybe if you're driving the brand of car that my company owns or has invested it, I route you along better (or worse) roads. Maybe I route you so as to avoid billboards from competitors. A more nuanced example is that of a dating application for, e.g., multi-colored robots. You can think of the color as representing any sort of demographic information you like: political leaning (as suggested by the red/blue choice here), sexual orientation, gender, race, religion, etc. 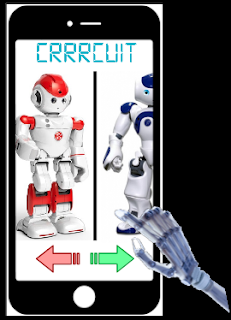 For simplicity, let's assume there are way more blue robots than others, and let's assume that robots are at least somewhat homophilous: they tend to associate with other similar robots. If my objective function is something like “maximize number of swipe rights,” then I'm going to want to disproportionately show blue robots because, on average, this is going to increase my objective function. This is especially true when I'm predicting complex behaviors like robot attraction and love, and I don't have nearly enough features to do anywhere near a perfect matching. Because red robots, and robots of other colors, are more rare in my data, my bottom line is not affected greatly by whether I do a good job making predictions for them or not. 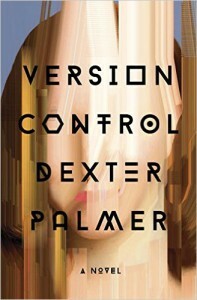 I highly recommend reading Version Control, a recent novel by Dexter Palmer. I especially recommend it if you have, or will, teach AI. It's fantastic. There is an interesting vignette that Palmer describes (don't worry, no plot spoilers) in which a couple engineers build a dating service, like Crrrcuit, but for people. In this thought exercise, the system's objective function is to help people find true love, and they are wildly successful. They get investors. The investors realize that when their product succeeds, they lose business. This leads to a more nuanced objective in which you want to match most people (to maintain trust), but not perfectly (to maintain clientèle). But then, to make money, the company starts selling its data to advertisers. And different individuals' data may be more valuable: in particular, advertisers might be willing to pay a lot for data from members of underrepresented groups. This provides incentive to actively do a worse job than usual on such clients. In the book, this thought exercise proceeds by human reasoning, but it's pretty easy to see that if one set up, say, a reinforcement learning algorithm for predicting matches that had long term company profit as its objective function, it could learn something similar and we'd have no idea that that's what the system was doing. Ravi Shroff recently visited the CLIP lab and talked about his work (with Justin Rao and Shared Goel) related to stop and frisk policies in New York. 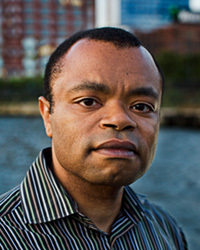 The setup here is that the “stop and frisk” rule (in 2011, over 685k people were stopped; this has subsequently been declared unconstitutional in New York) gave police officers the right to stop people with much lower thresholds than probable cause, to try to find contraband weapons or drugs. Shroff and colleagues focused on weapons. They considered the following model: a police officer sees someone behaving strangely, and decide that they want to stop and frisk that person. Before doing so, they enter a few values into their computer, and the computer either gives a thumbs up (go ahead and stop) or a thumbs down (let them live their life). One question was: can we cut down on the number of stops (good for individuals) while still finding most contraband weapons (good for society)? In this figure, we can see that if the system thumbs downed 90% of stops (and therefore only 10% of people that police would have stopped get stopped), they are still able to recover about 50% of the weapons. 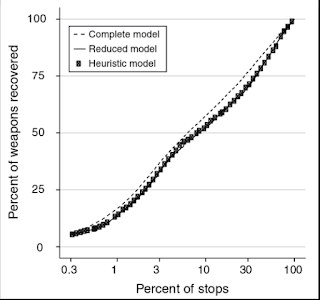 With stopping only about 1/3 of individuals, they are able to recover 75% of weapons. This is a massive reduction in privacy violations while still successfully keeping the majority of weapons off the streets. The question is: what happens if and when such a system is deployed in practice? The issue is that policy officers, like humans in general, are not stationary entities. Their behavior changes over time, and it's reasonable to assume that their behavior would change when they get this new system. They might feed more people into the system (in “hopes” of thumbs up) or feed fewer people into the system (having learned that the system is going to thumbs down them anyway). This is similar to how the sorts of queries people issue against web search engines change over time, partially because we learn to use the systems more effectively, and learn what to not consider asking a search engine to do for us because we know it will fail. Now, once we've (hypothetically) deployed this system, it's collecting its own data, which is going to be fundamentally different from the data is was originally trained one. It can continually adapt, but we need good technology for doing this that takes into account the human behavior of the officers. All the example “failure” cases I showed above have to do with race or (binary) gender. There are other things to consider, like sexual orientation, religion, political views, disabilities, family and child status, first language, etc. I tried and failed to find examples of such things, and would appreciate pointers. For instance, I can easily imagine that speech recognition error rates skyrocket when working for users with speech impairments, or with non-standard accents, or who speak a dialect of English that not the “status quo academic English.” I can also imagine that visual tracking of people might fail badly on people with motor impairments or who use a wheelchair. I am particularly concerned about less “visible” issues because we might not even know. The standard example here is: could a social media platform sway an election by reminding people who (it believes) belong to a particular political party to vote? How would we even know? We need to start thinking about qualifying our research better with respect to the populations we expect it to work on. When we pick a problem to work on, who is being served? When we pick a dataset to work on, who is being left out? A silly example is the curation of older datasets for object detection in computer vision, which (I understand) decided on which objects to focus on by asking five year old relatives of the researchers constructing the datasets to name all the objects they could see. As a result of socio-economic status (among other things), mouse means the thing that attaches to your computer, not the cute furry animal. More generally, when we say we've “solved” task X, does this really mean task X or does this mean task X for some specific population that we haven't even thought to identify (i.e., “people like me” aka the white guys problem)? And does “getting more data” really solve the problem---is more data always good data? If you've read this far, I hope you've found some things to think about. If you want more to read, here are some people whose work I like, who tweet about these topics, and for whom you can citation chase to find other cool work. It's a highly biased list. Joanna Bryson (@j2bryson), who has been doing great work in ethics/AI for a long time and whose work on bias in language has given me tons of food for thought. Kate Crawford (@katecrawford) studies the intersection between society and data, and has written excellent pieces on fairness. Nick Diakopoulos (@ndiakopoulos), a colleague here at UMD, studies computational journalism and algorithmic transparency. Sorelle Friedler (@kdphd), a former PhD student here at UMD!, has done some of the initial work on learning without disparate impact. Suresh Venkatasubramanian (@geomblog) has co-authored many of the papers with Friedler, including work on lower bounds and impossibility results for fairness. Hanna Wallach (@hannawallach) is the first name I think of for machine learning and computational social science, and has recently been working in the area of fairness. I'll also point to less biased sources. The Fairness, Accountability and Transparency in Machine Learning workshop takes place in New York City in a week and a half; check out the speakers and papers there. I also highly recommend the very long reading list on Critical Algorithm Studies, which covers more than just machine learning. Update on one of the articles you linked ("Prediction of Criminality"). Some independent researchers took a look at the original analysis and found it to be very flawed. Thanks for all the pointers!